Welcome cyber traveler! You have entered the realm of Project FRAC: a DIY robotics hobby project. 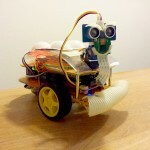 This site chronicles the journey of an electronics amateur who is building a pet robot from scratch, plus associated topics like electronics, embedded computing and maker culture. The latest addition to the Raspberry Pi product family just arrived at my front door, so here we go with the obligatory side-by-side picture! Today, to celebrate their 5th birthday, the Raspberry Pi Foundation announced an exciting new version of the Raspberry Pi Zero. Our favourite mini single board computer now includes a feature that many of us have wished for: wireless connectivity! A real or imaginary machine that is controlled by a computer and is often made to look like a human or animal. A machine that can do the work of a person and that works automatically or is controlled by a computer. (The third part of a running mini-series about the Raspberry Pi Zero, the second part is here). 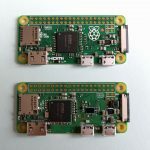 (The second part of a running mini-series about the Raspberry Pi Zero, the first part is here). (The first part of a mini-series about the Raspberry Pi Zero). …that this project is slowly coming back to life. And that there may be an autonomous exploration demo in the near future… stay tuned!